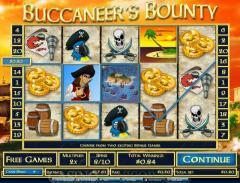 Buccaneer’s Bounty is a 5 reel and 20 payline video slot game. It is based on the ever popular pirate theme. The clarity of the graphics is amazing. The reels are set in the background of the high seas and clear blue skies with the island to one side. The symbols on the reels further enhance the pirate theme. The treasure chest is the wild symbol and the pirate ship is the scatter symbol. The pirates are led by the feisty female captain. The other symbols are the scallywag, the island, the parrot, the coins, the canon, the map, the skull and the kegs. Buccaneers Bounty boasts of excellent animations. The treasure chest withdraws to reveal an island surrounded by pirate ships. This is one slot game that should not be played with the sound is turned off. When the reels are not on display the sound of the sea waves can be heard. The music played while the reels are spinning is peppy. The coin size in Buccaneer’s Bounty starts at 0.01 and goes up to 40.00, with 35 rests in between. This makes the slot game suitable for both low rollers and high rollers. Players can enable up to 20 paylines. However wagering with 1 coin per payline is mandatory. Players can also choose from three game speeds. The fastest one eliminates the spinning of the reels. A comprehensive auto play facility is provided. The treasure chest is the wild symbol. It offers the highest fixed a jackpot of 6000 coins. 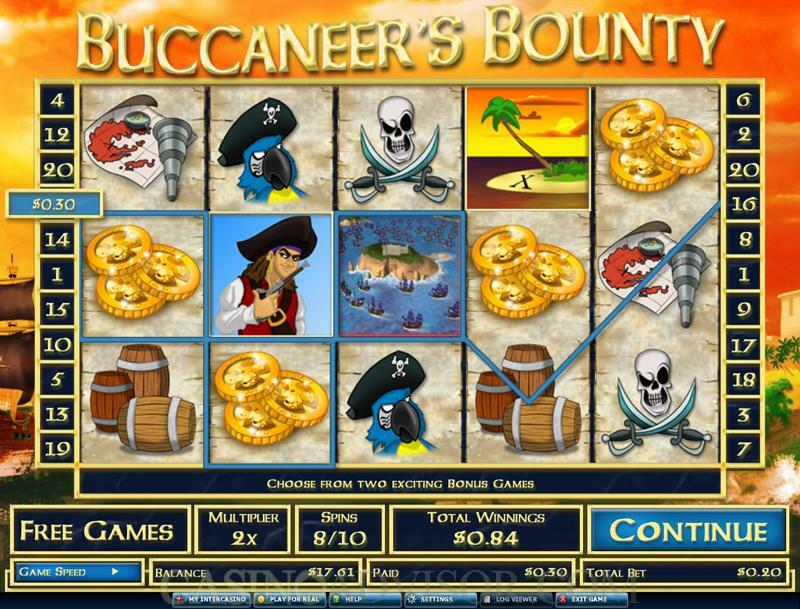 When the treasure chest appears simultaneously on reels 1 and 5, it triggers the bonus game on the second screen. The player can choose to be a pirate and attack the island or to defend the island from the pirates. In either case the game is identical, only the setting is slightly different. In the bonus game the player is given 10 cannonballs with which to sink enemy ships. As the ships pass by the player can click on them making them a target. If the cannonball hits the ship the player gets a payout which is up to 25 times the triggering bet. If the cannonball misses the player gets no reward. The bonus game displays realistically detailed animation of cannonballs firing, hitting the ships and the ships sinking into the sea. The pirate ship is the scatter symbol. 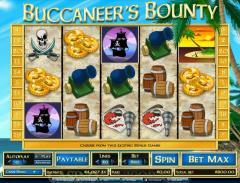 It provides scatter payouts and also activates the free spins bonus round. Unfortunately in both cases the scatter symbol has to appear left to right on the reels. Two or more scatter symbols result in scatter payouts which are multiplied by the total bet. Three or more scatter symbols trigger the free spins bonus round. In this round 10 free spins are offered at doubled payouts. Both free spins and the bonus game on the second screen can be triggered during free spins. 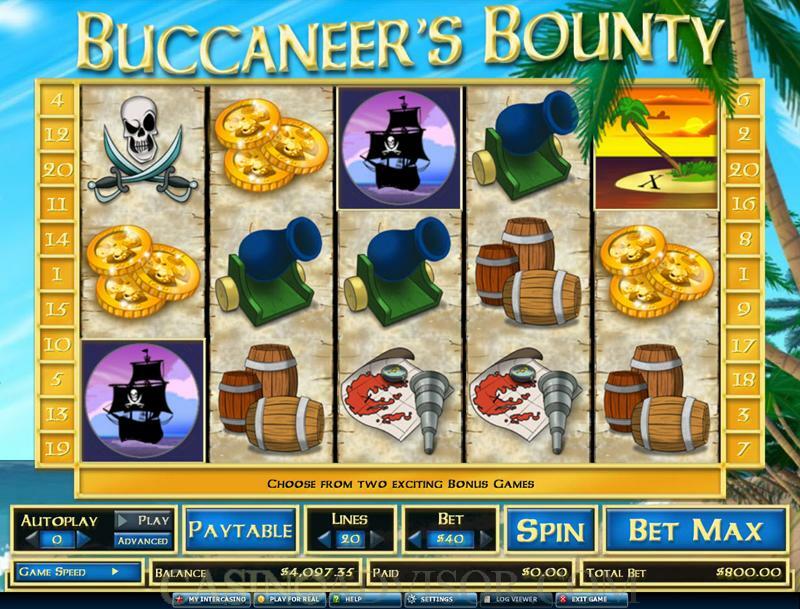 Interested in reading more detailed information about Buccaneer's Bounty? If so Click Here for more details.